This is NOT a router like Dlink, Netgear, Dovado, Linksys, Cradlepoint, Solwise or others sell for 3G. You need a 3G dongle for each laptop to connect to it. No WiFi for PSP, XBox, PS3, Archos, Internet Radios or iTouch or WiFi part of phones. It uses a private WiFi link between the two parts so may even interfere with use of a 802.11n or 802.11a Router/WiFi. (Uses 5.x rather than 2.4GHz band). It doesn’t improve coverage as it doesn’t go outside on chimney with a directional aerial. It sits indoor. It won’t work through Pilkington K-Glass Double Glazing. It just makes 3G available in a different room via dedicated WiFi. Doesn’t mention it’s not launched yet. 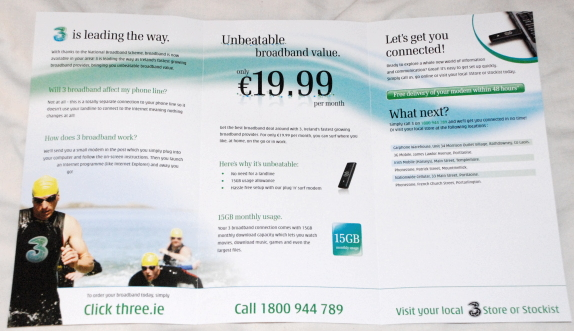 These leaflets are part of a 1.5m tall x 1m approx big “3 Broadband” display stand. The shopkeeper initially agreed to a photo until I told him it was for ASAI. 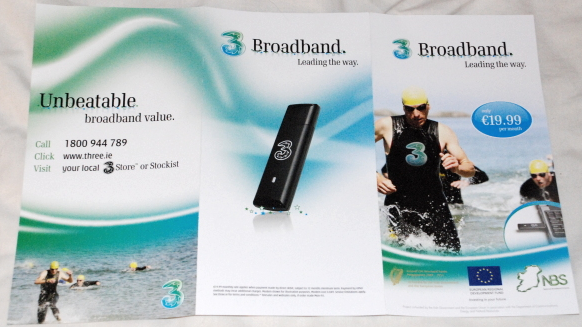 and much other 3 Broadband material. Nothing mentioned Mobile Phone Network. Little even mentioned Mobile. The two NBS leaflets and other material in same row. Are you getting non-3 3G or Broadband already there? My thought is that rather than Mobile simply not being Broadband it will almost kill further investment in Broadband and reduce Broadband penetration as a % of Internet usage. I think only UPC can survive long term subsidized mis-selling of mobile. Thus by this logic, the NBS is the most negative thing, the most damaging thing to take-up and roll out of Broadband services ever in Ireland. In combination with the Credit Crunch and the state of eircom the future of broadband development has never looked worse to me. (I don’t take Imagine/Google/Intel/Wimax thing very seriously for reasons I’ve mentioned before elsewhere). Is the NBS helping to Destroy Broadband Infrastructure?